As a woman who is constantly on the go and doing 1000 things at once, I hardly have time to relax. There’s no denying the effects that this fast-paced lifestyle can have on both our body and skin. We all know that a stressful and busy day at work can leave our skin looking tired and lifeless. However, there are two instances when my skin feels and looks its best: just after taking a long, hot shower and the minutes following a sweaty hot yoga sesh. After that, my body feels re-energized and rejuvenated, and my face looks ridiculously dewy, as if by magic. And the best thing is that I don’t do anything particularly groundbreaking beforehand. I only use a wipe and cleansing oil to remove my makeup. So you can imagine how frustrated I was when I was trying to re-create that same fresh, dewy look with a little makeup and willpower. Spoiler alert: It doesn’t matter how much setting spray and makeup primer I use, it just doesn’t look the same. But instead of crying over spilt milk or worse – giving up – I decided to reach out to top makeup artists in the business for tips that not only will help me to be a dewy goddess with skin so luminous even the moon’s jealous but don’t feel difficult to replicate either. First, though, let’s discuss the common denominator that all the experts gave me: the key to ensuring your makeup looks (and stays) dewy-looking depends heavily on your base. According to Allie Smith, a NYC-based makeup artist whose work has appeared in numerous big-name glossies, explained that prep is everything if you really want to have dewy skin that’s natural. “Take good care of your skin, make sure you’re using a good moisturizer, get rest, avoid things that dry you out, and drink tons of water,” she says. I also reached Julie Fredrickson, makeup artist and founder of Stowaway Cosmetics, a company that manufactures and sells makeup products for women, including beauty balms, creaseless concealers, cheek and lip rouges, creme lipsticks, eyeliners, and mascaras. She explained that one of the biggest mistakes she sees regarding dewy skin is using a lot of facial oils, only to apply gel and silicone primers on top of it. “Oil and water don’t mix, so don’t waste pricey facial oils by combining them with water-based products like gels,” she says. 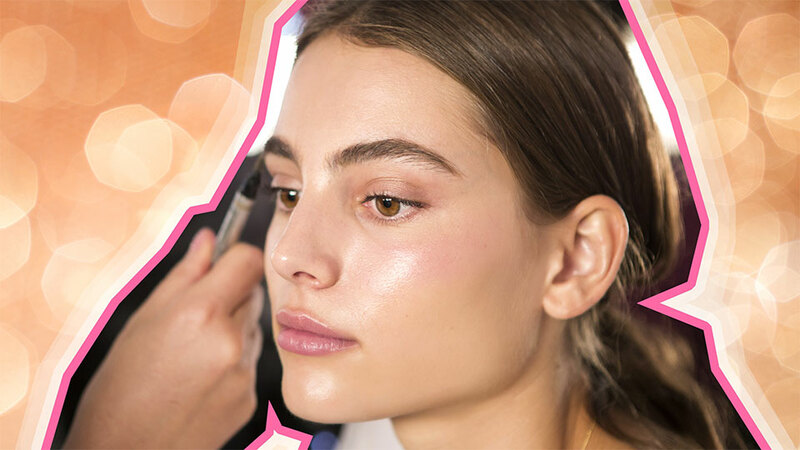 When we do this, our coverage doesn’t grip and it’s likely to slide down the face, creating that icky, greasy look instead of a sturdy canvas for the rest of our makeup. The facial oils absorb quickly into the skin, are non-greasy and lightweight, so using them alone will actually help your makeup adhere longer to the skin. They also keep your skin hydrated for longer and give you a dewy glow, rather than the ‘I need to wash my face’ shine. At the same time, be wary of using powders on top of it, since they’ll negate the dewy product you just put on your skin. Fredrickson also explained that she doesn’t use primer, except when she’s dealing with breakouts or uneven skin textures. She said that a primer can be helpful for those people who have oily skin that is already a bit slippery. She explained that matte primers won’t help much with a dewy look. However, she is not convinced that illuminating primers will do the job either. “You are better off simply using a great silicone primer and then applying a loose powder with a hint of shimmer to give the illusion of dewiness rather than forcing it on your first layer,” she says. When it comes to layering your skin products and makeup, you should use common sense. Make sure not to apply something which is meant to negate whatever the primary ingredient is in the product you applied first. For example, if you use a product that contains oil to prepare your skin, you should stick with a foundation which contains moisture-retaining ingredients, such as hyaluronic acid. However, she explained that this approach is not recommended if you are using gel or powder foundations. Those women who have oily skin that tends to eat away at creams can still get that amazing dewy glow with loose or mineral powder. Just use one that contains a finely milled shimmer because it subtly brings light to the face. It’s important to note that you can also use gel-based foundation because “they offer a lot of coverage, can handle sweat and humidity, and thanks to their water base, will give you a wetter look than a powder,” says Fredrickson. Many women also swear by a beautyblender. If you are one of those, know that even though they make blending easier, they tend to absorb a lot of product, so whether you use them instead of your hands or a brush is really just a matter of personal preference. Once your dewy coverage is intact, it’s very important to stick with just one type of makeup setter. Fredrickson explained that her rule is cream with cream and powder with powder. Most of the work in terms of creating that wet, not greasy look, but illuminating mists always up the ante should be done by your foundation or tinted moisturizer. Fredrickson’s personal favorite is Cover FX’s Illuminating Spray, since it’s alcohol-free and delivers an even, luminous finish. You can also apply a moisture-rich color product on top of what you’re already wearing if you want to skip a setting spray. For example, Fredrickson uses Stowaway’s Color Enhancing Balm, a multitask balm that you can apply on your cheeks for subtle flush to boost your natural color. Overall, the key to nongreasy, hydrated skin is using the things that make sense for your specific skin type and environment.